Automatically update your Highrise contact list with leads collected from Wufoo. Many of our users rely on Wufoo to be the first step in their relationship with their own users. Whether we’re being used as a simple contact form or a complicated lead generation interface, we know how important it is to start those first few moments with potential clients and customers on the right foot. We’re therefore delighted to be able to provide integration with Highrise, 37signals' approach to taking your newfound relationships to the next step. When coupled with our recently released real time notification platform, you can instantly update your contacts and leads into Highrise from a Wufoo powered form that can be embedded right on your web site or blog. We also provide a very easy field matching interface to associate all the different client information Highrise accepts with data collected from your forms. We're Wufoo! Our HTML form builder helps you create contact forms, online surveys, and invitations so you can collect the data, registrations and online payments you need without writing a single line of code. 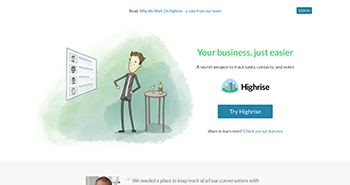 Highrise is a web-based CRM (customer relationship management) service developed by 37signals that provides a more thoughtful way to keep track of the people, conversations and tasks that are crucial your organization’s workflow. Used by thousands of small businesses and entrepreneurs to manage over 15 million contacts, the service is considered one of the easiest ways to monitor the progress of the leads and deals that make up your organization’s workflow. If you have other questions about how this integration works or need help setting anything up, please check out the documentation going over how to make our services work together with Wufoo's real time notification features or contact someone for support directly. Our features get your forms up and running in minutes – so you can get down to business. Check out some of our features below. Collect online payments in minutes. Protect your data by keeping it secure and clean. Choose from 400+ customizable templates. Customize themes and logos to showcase your brand. Understand your data and track performance.